Enter now the Exclaim! 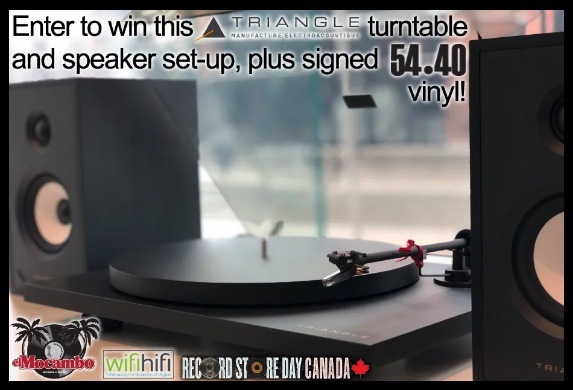 Record Store Day Contest for your chance to Win a Triangle Turntable and Speakers and more. To enter you simply have to visit the official contest web page and completely fill out the online entry form with your name, last name, email address, mailing address, city, province, postal code, phone number, age and your answer to the question “Which RSD release did we call downright charming?”, agree to the contest rules and submit it. Contest ends at 10:00 am on April 30, 2019. Winner will be selected by random draw from all eligible entries. There are two prizes available. Prize 1: A signed 54-40 vinyl and a Triangle speaker bundle including a turntable. Prize 2: A signed 54-40 Vinyl and a pair of Kanto speakers. The Exclaim! Record Store Day Contest begins at 1:11:00 PM EST. on Apr 12, 2019 and ends at 10:00:00 AM on Apr 30, 2019. The draw will take place on April 30, 2019.